Dark brown, velour leather Trachten bag for women. We all know that the right dirndl needs the right bag. This Schuhmacher design favours tradition and subtly. 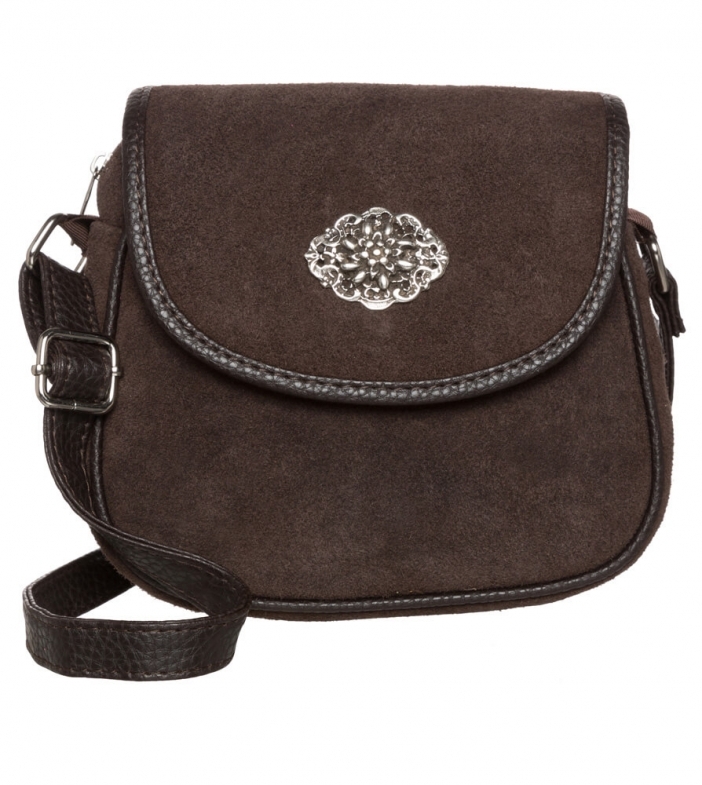 Soft velour leather, subtle decorative edging and a classic colour palette are the key features of this shoulder bag. The only decoration is a large metal edelweiss appliqué. The elegant straps are made from sturdy, smooth leather, are attached to the bag itself and can be adjusted for length. The main compartment can be closed not only with the magnetic fastener, but is also fitted with a zip for extra security. This little bag is the perfect size for safely storing all your valuables, from powder, to lipstick, to keys, money and phone. Ganz weiche zeitlose Tasche, die nicht nur beim Volksfest getragen wird.